The last few years, I’ve been very focused on the role and possibility of video in the classroom. Thus, my recent work developing Gif Lingua and EnglishCentral and my focus on the potential of a “Flipped Classroom“. I had an interesting skype discussion with Dan Soriano (@danhummsoriano ) at the BC in Mexico City. He’s thinking of adopting a Flipped Classroom model as an experiment. During our discussion I returned to a term I’ve used over the years, “Extensive Watching“. I’d like to outline this important concept for language learning here and get your own feedback, opinion, thoughts. b) Communication. Youth are so connected, never alone and a book entails the place and discipline to be alone with self. Today’s youth want shared experience, a social experience. A book is in their head, the images in their head – something is never shared. A film / video has an objective visual reference and is more shared/social. As I’ve outlined before, the Gutenburg Galaxy is waining. The role of text is taking a back up role to the cool medium that is the visual realm. This entails a change on the part of teachers. We should now update Day and Bamford’s classic and call it “Extensive Watching“. I took down the book from my shelf and revisited it. It can simply be re-written for this new media focus. 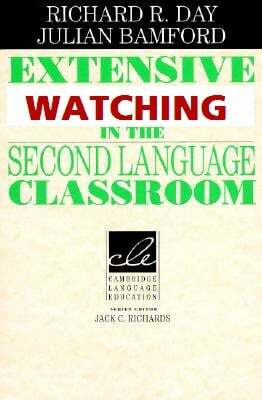 Students “watch” at their own level and through this massive watching of video with language in context, can, do, will achieve rapid language acquisition. That’s where EnglishCentral is coming from but it could be any source of video that is at the appropriate level for the student and contains motivating, interesting content. I looked at pages 7-8 of the book, “The Characteristics of Extensive Reading”. I hereby end and hand the torch to Extensive Watching by rewriting this to outline the characteristics of extensive watching (and in a future post, I’ll outline the differences, however obvious, with the “extensive listening” approach). 2. A variety of videos/film is available in a variety of genres and topics so as to encourage watching for different reasons and in different ways. 3. Students select what they want to watch and have the freedom to stop watching when the video fails to interest them. 4. The purposes of watching are related to pleasure, information and general understanding. The purposes are determined by the nature of the videos and the interests of the students. 5. Watching is its own reward. There are few exercises after watching and only for quickly reinforcing the material. 6. The videos are well within the linguistic competence (level) of the student. Video gives context and allows for a “wider” leveling. Dictionaries are used after the viewing and rarely during the watching of the video. Subtitles in the L2 may or may not be used depending on the objectives of the learning. 7. Watching is both shared and individual. Videos if possible, to be discussed and used as scaffolding material into purposeful communication and speaking practice. 8. Watching speed is at the natural rate of the media’s speakers. Whole watching is the recommended practice rather than stopping and reviewing video. 9. Teacher’s orient students to the goals of the program (communicate the rationale), explain the methodology (how to) and track what students watch, and guide students to get the most out of the program. 10. The teacher is a role model and watcher. They participate and watch what students watch. The extensive watching classroom is a place of equality and a decreased power dynamic between teacher and learner. To wit: Extensive Watching works and fosters student self learning and monitoring. It also has the added benefit of having pragmatic features of language (body language, postures, gestures etc…) that help the learner immensely (think of how a baby “makes meaning out of sound”). You’re on to something here. Great idea. I know that it was when I most watched TV in Japanese and Spanish that I made a lot of progress. Thanks for describing the idea in this easy-to-digest way. Thanks and yes, would seem obvious to anyone, teacher or student. We hear so often of students watching sitcoms / programs and making great progress. I don’t have time to rewrite the book but hopefully someone will latch on to the term (which I think communicates the approach well) and run with it. One thing in addition to those mentioned – I think unlike extensive reading – you have a lot of the pragmatic features of language (facial expressions, gestures, posture etc.. ) communicated and providing context to support learning. So it is more powerful but also more prone to mental fatigue (the brain turning off sooner than would with a book – there is a lot of processing happening). Great article !. thanks . Very interesting n insightful article. I am also into using videos in my own classrooms and they have been really helpful. A great language tool. It looks like a great idea for beginners because it is difficult to get them to read, at least books as books. But the whole idea of watching replacing reading is frightening (if that is what you meant) because reading has many more advantages in comparison to watching. Sujeeva – good point. Not meant to replace reading. But as second language educators, we can over compensate with “watching” – students would have learned and should continue learning to read in their L1. Those skills will transfer into L2. I would like to see an example one of your watching texts. Have you tried in an ESL classroom? I teach English as an L2 and and getting my students to read for pleasure is hard. I’ve tried everything in the classroom. Now making materials and doing curriculum design but for years worked n the everyday ESL classroom. I’ll post up here a nice presentation/talk I have about teaching reading in the EFL classroom soon.